This article outlines the Phase 2 specialist and Phase 3 career training undertaken by Royal Marines Officers and Other Ranks (known as Marines). The article will look at the structure of the Royal Marines (RM) and the organisation of training. The article will then provide a brief overview of the Commando Training Centre Royal Marines (CTCRM) and training support provided in the training of all phases of a Royal Marine’s training. This will be followed by an outline of the specialist careers open to Officers and Marines before finally looking at the cost of training. Several Riflemen capitalised on other opportunities during the Battalion’s time with the Commandos to complete amphibious training at Company level, mountain and arctic warfare training and the AACC. 3 Riflemen won Commando Medals which are awarded for the student on each Commando course whose performance and attitude best embodies the Commando ethos. 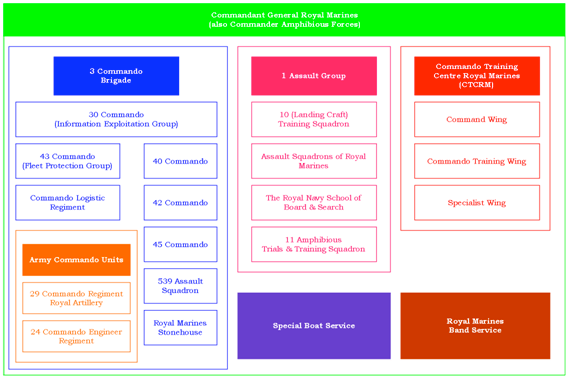 Figure 2, below, presents the ‘current’ (February 2014) Royal Marines military training landscape. The CTCRM selects and trains all Royal Marines Officers, recruits and reserves and is also unique in that it also provides all Non-Commissioned Officer (NCO) command training as well as training 70% of all Royal Marines specialists. Another unique point is that the Royal Marines is the only element of the armed forces to train officers and other ranks at the same location. CTCRM is the only UK training establishment that trains to Operational Performance Standard which means that on departing CTCRM all trainees are trained and able to deploy direct on Operations. CTCRM is a reasonably large organisation that has, on average, 1,300 recruits, 2,000 potential recruits and 400 potential officers attend training courses and acquaint courses every year delivered by approximately 500 trainers and support staff. In addition the Training Wings run upwards of 320 courses a year for a further 2,000 students. Whilst CTCRM has a relatively small campus it conducts training across the world making use of the extremes of climate and topography. 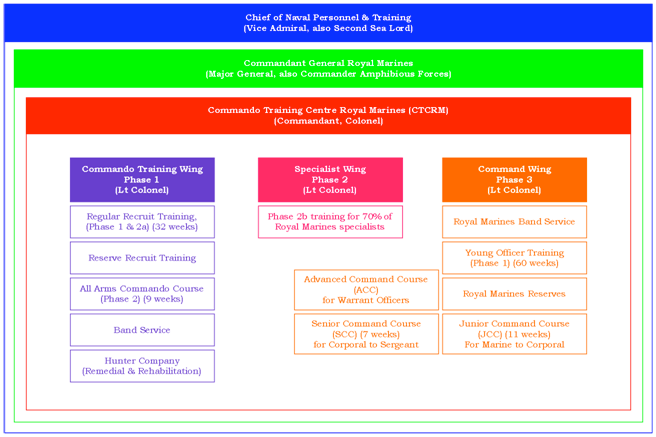 CTCRM is divided into 3 training wings, each commanded by its own Commanding Officer (CO) and supported by the Training Support Department which provides the training infrastructure. On-site training areas within the 77 acre base. In addition CTCRM has access to 2,500 acres of nearby Woodbury Common, as well as the training areas of Dartmoor and others in Wales and Scotland. The Command Wing is responsible for training all Royal Marines Young Officers (RMYOs) and NCO’s from Lance Corporal to Warrant Officer Class One. Command courses are undertaken by candidates for promotion, encompassing the military and leadership skills required at the higher rank as well as the management skills required for supervisory roles. The Command Wing is also responsible for the command training of the Royal Marines Band Service and the Royal Marines Reserves. The other 30% of Phase 2 training is delivered by other defence training establishments. The Training Support Department (TSD) is responsible for ensuring that all training at CTCRM effectively prepares personnel for their jobs working in (Marine recruits and RMYO) or alongside (AACC) the Corps. Additionally, the role of TSD includes monitoring, evaluating and influencing the extent to which training objectives are reached in relation to the expenditure of resources. The primary responsibility of the TSD is to oversee the management of training, ensuring a standardisation of policy throughout the CTCRM. Training Management coordinates the training schedules for all Wings, evaluates and maintains the quality of training and designs the training for new courses or alterations to existing courses. Education and Staff Training runs educational and current affairs training for Recruits and Young Officers. It also delivers a range of personal development courses for trained ranks such as; GCSEs, administering NVQs, resettlement courses and computer based Interactive Learning. Training Resources provides graphics support to all Wings for the benefit of Staff and trainees, and includes a training aids library, photographic section, reprographics section and illustrators. It is also responsible for managing and allocating to other units the Woodbury Common Training Area (WCTA) and Straight Point Ranges. After the passing-out parade, Marines will normally start their career as a General Duties (GD) Marine, serving as a Rifleman in a Commando unit, joining the Fleet Protection Group guarding the UK’s nuclear weapons or training to board ships at sea as part of a Fleet Standby Rifle Troop. The 32-week commando training at CTCRM provides Marines with all the skills they need to serve as a GD Marine. Aircrewman: as an Aircrewman, a Marine will work with helicopters of the Commando Helicopter Force and will be trained to work day or night in all conditions, and carry out important missions such as reconnaissance (missions to get information) or getting troops and supplies to the front line. After passing selection, a Marine will spend 40 weeks training at HMS Excellent and various RAF bases, covering everything from aviation medicine and combat survival to navigation and winch work. Another 20 weeks will be spent at RNAS Yeovilton preparing for operational flying. Armourer: the Royal Marines use a huge range of personal weapons, support weapons and equipment. As an Armourer, a Marine will be responsible for keeping everything from night sights to machine guns and sniper rifles working perfectly, whatever the conditions. The armourer course is 31 weeks at the School of Electrical and Mechanical Engineering (SEME) learning welding, sheet-metal work, general engineering and benchfitting skills, plus in-depth training on all weapons. Armoured Support: armoured vehicles provide Royal Marines Commandos with support and protection. Marines are trained to drive their colleagues through all types of environments (including swimming in deep water) and make sure their vehicles are in perfect working order, whatever the conditions. Marines will spend an initial 8-weeks training with the Royal Marines Armoured Support Company (ASC) at the Armour Centre at Bovington in Dorset. Marines will return for an extra 12-week (Class 2) course and then another 12-week (Class) course later in their careers. Assault Engineer: are trained to build bridges, field defences, obstacles and other structures used in commando operations. Marines will also be trained in mine warfare, demolition and using explosives on the 8-week basic engineering (Class 3) course. After a 9-week (Class 2) course Marines will be promoted to Section Commander, Engineer Reconnaissance or Company Engineer Adviser, and after the 10-weeks (Class 1) course Marines will be able to command their own troop. Chef: 21-week Basic Defence Chef’s Course at HMS Raleigh in Cornwall, then return to CTCRM for two weeks’ Field Cookery. Advanced Craft and Food Hygiene courses are completed later in an individual’s career. Clerk: provide expertise in human resources (HR) and information management (IM), administrative support and cash accounting within the Royal Marines, Special Forces and wider defence. The 9-week course provides training on the Tri-Service HR management system and the management of information on various other systems. Driver: An initial 2-week training period will qualify Marines as a Driver at the Defence School of Transport. Extra 5-week and 9-week courses will train Marines to drive everything from staff cars to heavy demountable rack off-loading and pick-up system (DROPS) supply trucks. Combat Intelligence: gathers information on the enemy, analyses that information and turns it into intelligence, then passes it on through written assessments, graphics and in spoken briefs. This intelligence will then be used to plan operations. Training takes place at CTCRM, the Defence School of Intelligence (DSI), the Royal School of Military Survey (RSMS) and the Maritime Warfare School (MWS). Combat Intelligence Specialist training lasts 17 weeks. Communication Technician: responsible for using state-of-the-art electronic warfare equipment and intercepting and analysing enemy radio activity to get information on their actions. This information will help Commanders to plan for, and carry out, operations on the ground. The basic training for this specialist job lasts 31 weeks. Progressive training is also available throughout a Marine’s career so they can keep up with changes in communications technology as they emerge. Language training will also be available for suitable candidates, which (currently) provides a significant financial reward. Drill Instructor: is a central figure in the lives of new recruits, with a vital role in training them to become Commandos, and also taking overall responsibility for ceremonial drills, drills on state occasions, such as remembrance parades, and other occasions. All training takes place at CTCRM on the 8-week course which covers husbandry, Corps history, basic and minor ceremonial drill. After promotion Marines will spend a further 5 weeks on sword drill, funeral arms and other aspects of ceremonial drill. Heavy Weapons Air Defence: protecting commando units and Royal Navy ships from air attack is a vital part of modern warfare. Air Defence Marines work as part of a small, tight-knit team and are trained in all aspects of air defence. All training takes place at the Royal School of Artillery, at Larkhill on Salisbury Plain, on the 6-week (Class 3) course. Marines go back for another 3-week (Class 2) and 4-week (Class 1) course as their careers progress. Heavy Weapons Anti-tank: are trained to identify enemy tanks and other armoured vehicles then use the Javelin anti-tank missile system and the heavy machine gun to hold back the enemy threat. 6-weeks training, at CTCRM, is spent on the heavy machine gun (HMG) and the Javelin. Further career training is conducted at the Land Warfare Training Centre, Warminster. Heavy Weapons Mortar: mortars are an important part of the RMs arsenal, helping them attack enemy forces from nearly six kilometres away. Marines will learn how to operate mortars and accurately direct fire onto targets. 4-weeks at CTCRM provides training on the 81mm mortar. Further career training is conducted at the Land Warfare Training Centre, Warminster. Information Systems: computer networks allow the delivery of up-to-date battle information to Royal Marines Commandos working in the field. Information Systems Specialists are trained to design and maintain this vital and complex equipment. Marines will spend 31 weeks’ training at the Defence School of Communication and Information Systems (DSCIS) at Blandford in Dorset. Landing Craft: the RM use various types of landing craft to transport Royal Marines Commandos from ship to shore. Marines are trained to drive all types of assault vessels, from small, high-speed raiding craft to vehicle carriers and hovercraft. Initial training as a Landing Craft Specialist takes 16 weeks, followed by two further career courses of 15 weeks (Class 2) and 16 weeks (Class 1). Mountain Leader: highly-trained in the art of long-range reconnaissance, operating in small groups forward of friendly lines and reporting information back to the Command. The initial 30-week training course starts with climbing and mountaineering, followed by surveillance, reconnaissance and training in survival skills. Marines also work in mountainous and cold-weather environments where they learn to ski, climb and operate to a high standard, finally progressing to a parachute basic course. Mountain Leaders also provide instruction, when needed, to all other arms of the British forces. Platoon Weapons Instructor: train their fellow Royal Marines Commandos, Non-Commissioned Officers (NCOs) and Officers in all aspects of weapons handling and marksmanship. Roles include Modernised Urban Combat (MUC) Instructor, training snipers and working with armed forces from other nations. Stores Accountant: make sure Royal Marines Commandos have the right kit in the right place, at the right time. After a 2-week introductory course, Marines will work as a Stores Accountant for approximately two years. The Class 2 and Class 1 courses are both 7-weeks long. Medical Assistant: learn advanced first aid and skills to deal with accidents and emergencies, carrying out life-saving procedures in the field with limited medical facilities. Training is 50-weeks in duration. Metalsmith: develop a range of skills, including sheet-metal work, repairing glass-reinforced plastic, blacksmithing techniques, welding, panel beating and oxyacetylene cutting, to keep vehicles, boats and other equipment in working order. To qualify as a Metalsmith, Marines undergo specialist training which lasts 35 weeks. Marines achieve their first promotion (Lance Corporal) based on work in their personal development record and a third promotion (Corporal) after another 26 weeks’ training. Military Police: are in charge of security and convoy control, enforcing the law, responsible for protecting senior officers on operations, or personnel from the British Embassy and High Commission in countries around the world. To qualify as a Military Police Specialist, Marines will go through an intensive 21-week course covering investigations, close protection, enforcing the law and other aspects of this responsible and challenging specialist job. Physical Training Instructor: responsible for delivering physical training and combat conditioning, sport, adventure and recreational training for both recruits and trained ranks. After qualifying there are opportunities to specialise as a close-combat, rehabilitation or adventure-training instructor. The initial course is 17-weeks, followed by 3-weeks in Wales to gain basic adventure training qualifications; plus an optional 3-week course for aspiring adventure training (AT) instructors. Signals Specialist: provide communications between land, sea and air forces and Royal Marines Commandos in the field, using everything from satellite links to hand-held radios. Initial training (Class 3), based at CTCRM, lasts 14-weeks, with the Class 2 and 1 course lasting 10 and 14 weeks respectively. Telecommunications Specialist: train in electronics and telecommunications, and be involved in maintaining and repairing radio-communications links. Initial training is a 14-month modular course, followed by another 7-months’ training for a Marines first promotion (Lance Corporal). The final step is an 18-month course. Yeoman of Signals: as a Senior NCO in the communications field, Marines can apply for further training as a Yeoman of Signals. In this specialist role Marines manage the complex communications planning for brigade level and commando operations. The training course lasts 9-months and is delivered by the Royal School of Signals (RSS) at Blandford in Dorset. Vehicle Mechanic: initial training lasts for 52-weeks. Further training within a commando unit, and a more advanced course lasting a further 52 weeks, can lead to promotion. Swimmer Canoeists: are members of the Special Boat Service (SBS). Once an individual has passed the UK Special Forces Selection Course (a big achievement in itself) they will be trained to the highest standards in surveillance, reconnaissance, parachuting and survival skills. The SBS is part of UK Special Forces and as such much of the information on training and qualifications is highly sensitive, so specific details cannot be given. Special Forces Communicator: provide direct, close-support communications to the SBS and all other parts of the UK Special Forces. Training last 23-weeks and covers a wide range of communications and skills it takes to be in the Special Forces, including Search Evade Resist Extract (SERE) and training in hostile environments, parachutes and medical training. This challenging course is conducted at a number of locations including Sennybridge (Wales), Hereford, Scotland and Cyprus. After the completion of Phase 1 initial training, Officers will be appointed as a Troop Commander and start their Phase 2 specialist training. This involves commanding a troop of around 30 men, with an experienced Troop Sergeant as a Second-in-Command (2IC) who will provide support as needed. As a Troop Commander, Officers will also work closely with their three Corporals, who take on much of the day-to-day running of the troop, and the Company Commander (a Major). Heavy Weapons: train how to tactically use mortars, anti-tank and anti-aircraft weapons or the heavy machine gun. Officers could be responsible for up to 80 other Heavy Weapons Specialists as well as their vehicles and equipment. Training will depend on which job an Officer undertakes, however, as a guide Officers will undertake a 1-week course at CTCRM, followed by a 9-week Commanders course at Land Warfare Training Centre in Warminster. Officers specialising in heavy machine guns will go through a 1-week intense course at CTCRM. Intelligence: put together and interpret the information that senior officers need to make vital decisions. Pilot Officer: flying the helicopters of the Commando Helicopter Force, Officers could be delivering troops and supplies to the front line, carrying out reconnaissance missions, evacuating injured people or launching a land attack. Officers could also be chosen to train as a fast jet Pilot alongside Royal Navy colleagues. The exact course and length of training depends on whether an Officer chooses to fly helicopters or fast jets. All flying training is demanding, but extremely rewarding. Landing Craft: are specialists in amphibious operations and train to plan and oversee beach assaults and raiding operations, command landing craft and supervise maintenance. Officers spend 17-weeks training to become a Surface Manoeuvre Expert, getting qualified on the inshore and offshore raiding craft and the rigid inflatable boat (RIB). Officers also learn to use landing craft and receive training on navigation right through to beach reconnaissance and amphibious planning. Physical Training & Sports: physical fitness is central to life in the Royal Marines. Physical Training and Sports Officers plan and manage training programmes for large numbers of men, and are responsible for running a physical training wing. Training is a 6-week course followed by an 8-week course. Signals: specialise in planning and managing information communications systems. Training is modular, with three modules that will last for 10-weeks and will cover equipment, theory, communications planning and management. Swimmer Canoeists: are members of the Special Boat Service (SBS). Once an individual has passed the UK Special Forces Selection Course (a big achievement in itself) they will be trained to the highest standards in surveillance, reconnaissance, parachuting and survival skills. The SBS is part of UK Special Forces and as such much of the information on training and qualifications is highly sensitive, so specific details cannot be given. Officers will become experts in swimming, diving, parachuting, navigation, demolition and reconnaissance, and eventually lead missions with the UKs Special Forces. MoD figures show that training a Royal Marine from recruitment to graduation at CTCRM costs approximately £54,000 (Kirkup, 2011), meaning it is more expensive to train a Royal Marine Commando than their British Army Infantry soldier counterparts. Kirkup, J. (2011) Royal Marines Training Cut as Afghanistan Looms. Available from World Wide Web: http://www.telegraph.co.uk/news/uknews/defence/8326144/Royal-Marines-training-cut-as-Afghanistan-looms.html. [Accessed: 04 April, 2014].